“Like father, like son” is an old idiom meaning that the child closely resembles the parent, either in terms of looks or behavior. Now that we have some understanding regarding that saying, let’s take a look at the comparison we captured in our featured image. Campaign signage requirements in Maryland (§ 13-401 of the Election Law Article) require each political sign to contain an “authority line” that states the name and address of the person responsible for producing and distributing the sign (the address is not required if it is on file with the State Board of Elections). For example, the caption might read “Committee to elect Jane Doe, John Smith, treasurer.” See section 12.1 of the Maryland Elections Guide for more details. With regard to sign placement, campaign signs do not require a permit but are prohibited from being placed on public rights-of-way, road shoulders, or medians. See the Maryland Highway Administration’s outdoor advertising FAQ’s for further information. On days when elections are held, signs are not allowed within 100 feet of the entrance to a polling location (MAC 33, § 16-206). What should really concern voters is the arrogance of this type of activity. For one, it is flat out illegal. Second, there is no excuse for either of the two veteran politicians, both of whom are well aware of the laws regarding the placement of election signs. 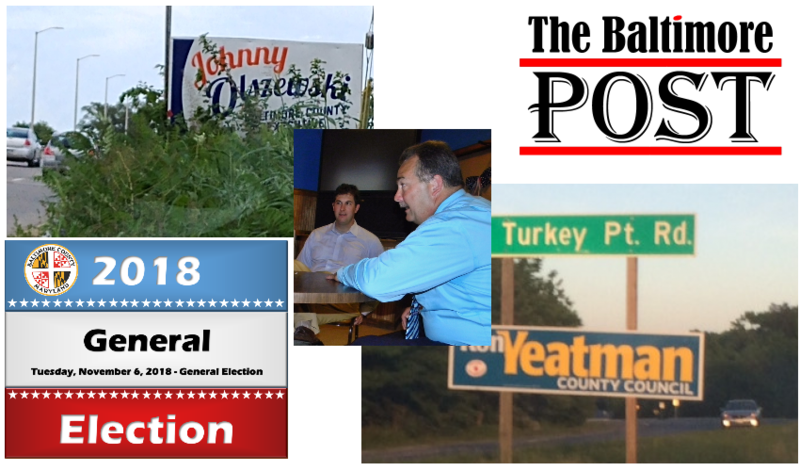 Funny enough, Chief James Johnson said he is committed to the strict enforcement of election laws, and that any campaign sign violations that occur during this time of year will be investigated thoroughly. It appears that not much is changed since that issue came about back in 2014. The alert person who contacted The Baltimore Post about the election signs also claims to have filed a complaint with Baltimore County Code Enforcement. That was well over one week ago, folks. By the way, we just want to point out that the recent large-scale juvenile violence at the White Marsh Mall, which led to nine arrests, did not even register one word on Johnny O’s political site. That brings us to our final point regarding legal matters and the upcoming election. The law, particularly respect for its application, is paramount to a civilized society. Without that respect there cannot be a functioning society, much less a government and leaders of said government. We wonder whether or not the caller who contacted the Post spoke with another close relation to John Olszewski, Sr., since his son works for Baltimore County Code Enforcement. By the way, at press time, the Johnny O campaign sign was still quite visible, though it is showing extensive wear and tear.